The Life Fitness G7 Cable Motion Gym System With Bench has Assisted pullup, Assisted pushup, Hanging leg raise, Forward walking lunge, Lateral walking lunge, Body weight pullup. - Chest press, Converging chest press, Decline chest press, Converging incline chest press, Close-grip chest press, Extended-arm pec fly, Unsupported chest press. - Lat pulldown, Narrow grip pulldown, Seated row, Internal rotation, External rotation, Front raise, Shoulder press, Low row, Lateral raise, Rear deltoid, Reverse fly, One-arm fly, One-arm cable row. - Incline biceps curl, Standing biceps curl, Seated biceps curl, Reverse biceps curl. - Triceps extension, One-arm triceps extension, Overhead triceps, extension, Seated triceps extension, Triceps kickback. - Abdominal crunch–high pulley, Seated abdominal crunch, Kneeling abdominal crunch, Oblique twist. - Standing leg extension, Standing leg curl, Hip abduction, Hip adduction, Calf raise, Lunge, Squat. Two dual weight stacks allow you to exercise one side of the body at a time or both sides at the same time. 20 ultra-smooth pulley adjustments per column enable users to perform a virtually endless number of exercises. Quick Lock cable end attachments make switching out attachments quick and easy. Chin-up/pull-up bars are correctly angled for biomechanically-correct upper-body and core exercises. Mounted Exercise Book shows you how to perform over 60 exercises, allows you to build your own workouts and track your progress. Training DVD allows you to follow along with a certified personal trainer as she guides you through 2 workout routines. Space-efficient design fits nicely in a corner. 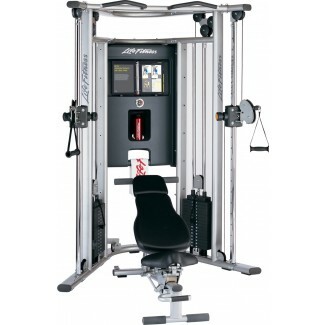 Click the button below to add the Life Fitness Life Fitness G7 Cable Motion Gym System G7 Gym With Bench to your wish list.